More politics from moi. I'm OCD on this election. PBS has an online poll posted asking if Sarah Palin is qualified. Why bother asking, you might wonder? Yes, I know, but I am, unfortunately, serious. Read on. Rumor has it that the Republicans knew about this PBS poll in advance <gee, is this possible?> and are flooding the voting with YES votes. And, um, while I might normally be dis-inclined to believe such a "flooding" accusation as just being so much hype and hyperbole...I just put in my response and currently 49% are saying YES to Palin being qualified. For the role of Vice-President. Of the United States of America. Clearly, then, I must conclude that some flooding is probably actually occuring. There's just no other logical explanation other than, perhaps, hacking. I beg of you -- flood back!! If you, like myself, don't in fact believe Palin to be qualified to act as the Vice-President of the United States of America <gheesh, just saying that in my head gives me the shivers), please do two things. The time commitment here is less than 20 seconds. Truly. 1) Click on the link and vote yourself! Here you go: http://www.pbs.org/now/polls/poll-435.html. 2) Send this to every single Obama-Biden voter you know, and urge them to vote and pass it on. 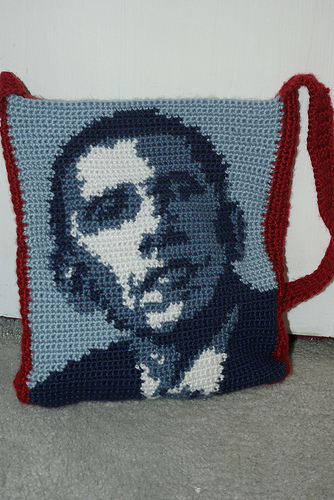 Check out this great bag, via The Obama Craft Project -- "crafting for change" (a very cool site). I'm a member of the Sierra Club and thought I'd share an email I received from them endorsing Obama, in part due to his Energy Plan. Providing Relief for families struggling to pay their energy bills. His plan is to provide families with a $1,000 tax credit and stimulus checks paid for by taxing the oil companies’ record profits. Investing $150 billion over the next ten years in alternative sources of energy -- wind and solar power, and advanced biofuels, in the commercialization of plug-in hybrid cars, and development of a new digital electricity grid. This investment will create up to 5,000,000 good-paying jobs that cannot be outsourced and will create the billions in new economic activity that will put America back on the path to prosperity. Requiring 25% of U.S. electricity to come from renewable sources by 2025 and increase energy efficiency in the U.S. 50% by 2030. Attacking global warming. Obama has presented a bold and comprehensive plan for addressing global warming which includes a "cap and auction" system that would cut our carbon dioxide emissions 80% below 1990 levels by 2050. Rejecting drilling as the answer to our energy woes. Obama knows that drilling off of our beaches and destroying our last special places like the Arctic National Wildlife Refuge in order to pad Big Oil’s bottom line won’t do anything to lower gas prices today, tomorrow, or even a decade from now. If this all sounds good to you and you want to learn more about Obama's Energy Plan, go to http://www.barackobama.com/issues/energy/. I sometimes daydream about what we as a country might have done with all the money we now owe for the current war; what we could have done if we'd applied some big-picture, long term thinking. For example, what if we'd subsidized a new manufacturing infrastructure for our automotive manufacturer's instead? We've been floating the airline industry forever, why not help out the car makers in a "teach them how to fish" way, one that will ultimately lead to a greener environment and a new economy for our nation? What if people were given tax breaks for having their vehicles modified to be more eco-friendly? Transformed into hybrids, or made to run on french fry grease, or whatever? What if now, instead of being a nation whose infrastructure is set up to depend on gasoline that's rapidly approaching $5/gallon, we were on our way to becoming a country requiring very little in the way of petroleum products to keep operating productively? Isn't that a cool thought? Keep your freakin' oil & fight amongst yourselves. Nope, we're not interested. They're not home right now, can I take a message...? Wouldn't that be something? I mean, supposedly our war has nothing to do with oil & all, but <ahem>...yeah. I'm just sayin'. BTW, have any of you seen the TV series of NPR's This American Life? Awesome stuff. A recent episode is super interesting -- it's called Talk to an Iraqi, and is about an Iraqi student in the U.S. who set up a booth with signage & had conversations with whoever stopped by. Fascinating. I found it on YouTube here if you want to watch it (or it's available on-demand if you've got digital cable and Showtime).